I'm all about the kitchen stuff. I love to entertain, and I love to cook so I look for products that are practical AND pretty! I introduce you to the very innovative Cali Bowl! CaliBowl recently sent me one of their Cali Stacks in tomato red to try out. The Cali Stack is awesome because it is a set of different sized bowls: a 5 cup, 3 cup, 1.5 cup and 1 cup. Because the bowls are all in different sizes, they are perfect for entertaining or every day use. When we have people over I always put out dips like salsa and guacamole. I like to be able to prepare and present food in the same container and CaliBowls let me do that! These bowls are great because they can go from the fridge, to the microwave, and then straight into the dishwasher! No need to heat in a different container and transfer in, and no need to hand wash! But the best feature of all of these bowls is their patent-pending no-spill lip! You won't end up with dip running down the side of the bowl or salsa chunks falling on the table. The bowls are specially made to keep the contents in the bowl - and to help guide food onto your fork or spoon. But my favorite, favorite thing to use the CaliBowl for is oatmeal! My mornings are always rushed, so I often make instant oatmeal in the microwave for a quick breakfast. Unfortunately before the Cali bowl- the oatmeal always bubbled over the side and made a huuuge mess (which didn't help my morning rush!) With the Cali bowl I don't have this problem!!! 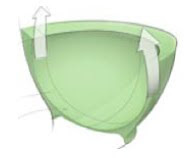 As the oatmeal (or whatever else you put in the bowl) is forced to the side of the CaliBowl, it triggers a wave-like recirculation and the the contents are kind of pulled back down into the center of the bowl. It sounds so sci-fi, but I swear it really works! And because CaliBowls are made from durable Polypropylene - they are made to last. They feel very solid (but still lightweight)! Want to try your own set of Cali Bowls? 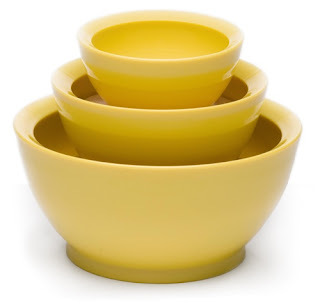 One lucky Frugal & Fabulous Reader will win a Big Sur Stack of Cali Bowls in their choice of color! *Tell me what your favorite item is from the CaliBowl web site! You have until Friday, October 2 @ 7pm EST to enter! (Winner must respond within 48 hours.) Giveaway open to U.S. residents only. I like The Cali Stack- Plastic Multi Pack ! I would love to stock my kitchen with the ceramic nesting set. The blue is beautiful and I'd love to see the aqua! I'm already a follower, so I hope that signs me up for more entries! I really like the Del Mar Stack - Ceramic Single Serving bowls. I am always looking for small bowls to put various things in. Great giveaway! I just added a link to your blog on my blog. Love these! And I love the red. Would look soo cute in my kitchen. I added this fab giveaway to my giveaway side bar on my blog. I love the Plastic Single Serving Bowls. I like the Cali stack multi pack bowls! I do a lot of cooking these would be great to have. Thanks for the chance to win! I entered the Modbe jean contest. i love love love The Santa Barbara Stack- Kid Pack! These are cool. I would love to win. I love the kids bowls! and all the colors are so bright! I have entered the shall giveaway as well! If I were buying, I might get the cereal bowls, but I really like the Big Sur stack in Tomato Red. My favorite color! And who can't use more bowls! I entered your Nimli giveaway. The Santa Barbara Stack- Kid Pack. these would be perfect for my daughter. I've already entered the modbe jeans giveaway. The suction bowl would be perfect for my toddler, thanks! The Santa Barbara stack for kids learning to eat on their own sounds great! My son eats oatmeal ever morning and this would help him to not spill! Thanks! My favorite are the mixing bowls. I also entered the Modbe jeans contest. I follow your blog on blogger and Google Friend Connect as "maggie"
I'm a Facebook Fan of Frugal & Fabulous as Maggie Mannwieler. I am now a Facebook Fan of CaliBowls, as Maggie Mannwieler. I like the suction bowl! I like the The Santa Barbara Stack-Kid Pack in Aqua Blue. Very nice-Thanks for the giveaway. I entered your Modbe Jeans Giveaway. Thanks! I entered your Azuri Cashmere Pashmina Shawl giveaway. Thanks! I follow you and CaliBosl on Twitter and I tweeted your giveaway. Thanks! I like the Cali Stack - Ceramic Multi Stack, love that blue too. I like the suction bowl. I love the The Santa Cruz Stack Plastic Mixing Bowls. I follow CaliBowl on Facebook. The Santa Cruz Stack- Plastic Mixing Bowls, perfect for out parties. Name, brenna chavez. Email, brennaboo/gmail. Fave item is the Cali Stack - Ceramic Multi Stack in Avacado. I really like green, I really like the no spill lip, and I really like these being made with safe new materials. I entered the Azuri giveaway. Tweet: http://twitter.com/brennaboo/status/4361929899. I follow both you and calibowl. I like the The Cali Stack- Plastic Multi Pack in Tomato Red. I entered the Azuri Cashmere Pashmina Shawl giveaway. I also like the The Santa Barbara Stack- Kid Pack. I think I would like the aqua blue for my kids in these! I think my fav are the Del Mar Stack- Plastic Single Serving Bowls. I also entered the Pashmina giveaway. Thanks! I love the suction bowl! What a great idea. I'm a fan on fbook! I love the Del Mar Stack - Ceramic Single Serving bowls! Tweeted about the give-away and following you & cali bowls on Twitter! I love the GREEN Cali Multi Pack set of bowls. I'm a facebook fan of F&F. I've already entered your Pashima Shawl Giveaway too. I like the ceramic mixing bowls. I entered your Azuri Shawl giveaway. I like the mixing bowls. Entered Azuri Cashmere Pashmina Shawl! Frugal & Fabulous facebook fan@tcarolinep JessieKatie S.
I like the The Cali Stack- Plastic Multi Pack! I could always use a mixing bowl around here! I'm a Frugal and Fabulous facebook fan! I would like the suction bowl. I think we will be needing that soon in our house!! I like the La Jolla stack. I like the kid bowls. Those look really cool. I would like to try the kid pack, love the colors of those bowls. I like the suction bowl best. Pretty much in love with the ceramic multi-stack in steel blue... I can never find anything like this that compliments the color of my kitchen! Steel blue is AMAZING!!!!! I have just joined the Cali Bowl Group on facebook. I am now a fan of frugal & fabulous on facebook!! I love the suction bowl for toddlers! Love the red color... my kitchen's accent color is red! I like the kid bowls. Great colors! I entered your Nimli giveaways! I love the colors of the bowls - so much fun! I entered the Azuri Cashmere Pashmina Shawl giveaway as well. I think the suction bowl is a neat idea! I love the Suction Bowl! I also entered your NVM 9 Wax Denim Jacket giveaway! Love the Santa Cruz mixing bowls, so practical! These are great. I also like the Santa Cruz Stack - Ceramic Mixing Bowls. Thanks!